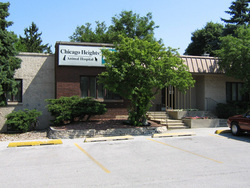 Welcome to Chicago Heights Animal Hospital, your local veterinarians in Chicago Heights. We’re pleased to provide a wide variety of veterinary services for dogs and cats in Chicago Heights and surrounding areas. Our team is dedicated to providing the best care possible for your pets. Our facility is equipped with the latest equipment. This helps our doctors diagnose and treat most problems as quick as possible. We also maintain excellent relationships with nearby specialists should your pet need referral for specialized care.